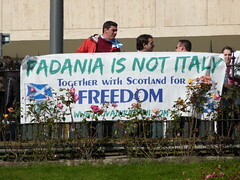 The March and Rally for Independence in Edinburgh last Saturday was full of people from all over Europe supporting Scotland’s quest for independence: There were fifty Flemings, a large group of Venetians, and smaller groups of people from Catalonia, the Basque Country and Padania (North Italy). However, there were no Danes (apart from me and my daughters, I presume), no Estonians, no Croats. In other words, the international supporters were all from other non-sovereign nations seeking their independence, not from countries that are already internationally recognised independent states, even if that independence was only achieved within the past twenty years. I guess it’s natural — Scotland, Euskadi (the Basque Country), Catalonia and Flanders all face similar obstacles, and they can help each other overcome them. However, it’s a bit of a shame that the sovereign countries don’t want to get involved. In the case of the neighbouring countries, such as Ireland, Iceland, Norway and Denmark, the emergence of an independent Scotland would have a significant impact on their world, and they might well find Scotland easier to work with than the current UK, so it could be in their interest to support the Scottish independence movement. In the case of the countries that gained their freedom within the last couple of decades, they must have gained a lot of experience in the process, experience which could benefit us in Scotland. I suppose sovereign countries will get in trouble if they support other countries’ independence movements openly. However, I don’t believe there’s anything that would prevent private citizens in other countries from forming groups to support Scottish independence. Perhaps I should simply start up Danes for Scottish Independence on Facebook?